Fool me once, shame on you. Fool me twice shame on me. Dribble coffee on my shirt for the 20th time, you are my worst enemy. I thought I hit paydirt when I found the Bubba Keg. I consume way too much coffee, I know. 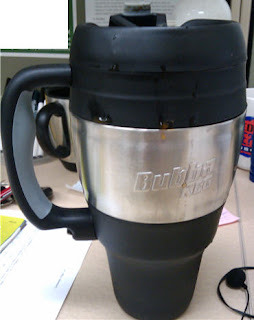 But this thing allowed me to bring 34 oz of home brewed goodness to work. 7-11 coffee was starting to cut into the household budget. Side note: I usually didn’t finish the entire 34oz. The Bubba Keg is big, but not obnoxiously big. The problem with me going with a quality brand like Thermos is a 34 ouncer would be enormous. I basically wanted a big cup that I can travel from home to work with (oh and that doesn’t leak all over the place)–and can fit into a standard car cupholder too. I’ll sacrifice heat for the convenience of carrying it. I don’t like piping hot coffee anyway. Only one problem. The friggin thing leaks like a sieve. No matter how tight I screw the lid, the thing leaks. I’m not sure why it took at least 20 stained shirts for me to finally hate and give up on this thing. I have a pet peeve with inferior products. Bubba Keg is on my S list big time now. I even took a pic. See the damn dribble lines? About half of that is on my shirt. I got mine yesterday. This is happening to me too. My world is shattered. People watch me drinking and assume I'm drooling, but I'm like, "It's the mug, I swear!" and they look at me like, "Then why do you continue to carry around that big ugly mug?" It's a shame. A damn shame.